Venus is a rarity among planets – a world that does not generate a magnetic field internally. However, Venus does have an elongated magnetotail on its night side. Furthermore, Venus Express has discovered evidence for magnetic reconnection – the process responsible for the Northern Lights on Earth – in Venus' magnetotail. As on Earth, solar ultraviolet radiation removes electrons from the atoms and molecules in the upper atmosphere, creating a region of electrically charged gas known as the ionosphere. This ionised layer interacts with the solar wind and the magnetic field carried by the solar wind. During the continuous battle with the solar wind, the ionosphere is able to slow and divert the flow of particles around the planet, creating an elongated magnetotail, shaped rather like a tadpole or wind sock, on the lee side of the planet. Until now, magnetic reconnection was not generally thought to occur near non-magnetised planets, so scientists were surprised when Venus Express found the first evidence of this process in Venus' magnetotail. Reconnection converts magnetic energy into kinetic energy in the form of accelerating particles and occurs when oppositely directed magnetic field lines break and connect with each other. On Earth, it is responsible for magnetic storms and polar auroras. At Earth, the process occurs at a distance of about 10-30 planetary radii down the magnetotail. Since Earth's magnetosphere is 10 times larger, reconnection at Venus would be expected to occur 1-3 radii down its tail - precisely where Venus Express detected the reconnection events. The reconnection splits the magnetotail, causing most of the plasma (electrically charged particles) in the tail to be ejected into space. It also forms a plasmoid structure which heads towards Venus and channels some of the energy of the solar wind into the night-side atmosphere. 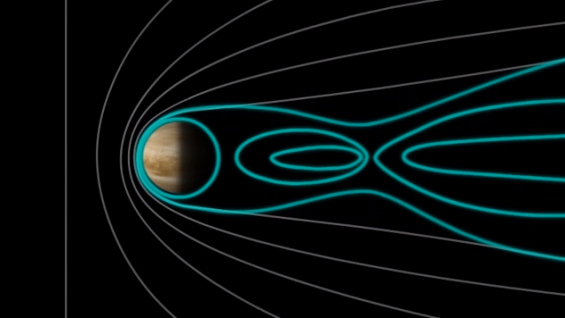 As a result, the magnetic reconnection causes plasma circulation at Venus, similar to what happens in Earth's magnetotail. The discovery was made possible by the near-polar orbit of Venus Express, which is ideal for instruments such as the magnetometer and low-energy particle detector to observe the solar wind – ionosphere – magnetotail interaction. Previous missions, such as Pioneer Venus, have either been in different orbits or been active at different periods of solar activity, so they were not able to detect the reconnection events.